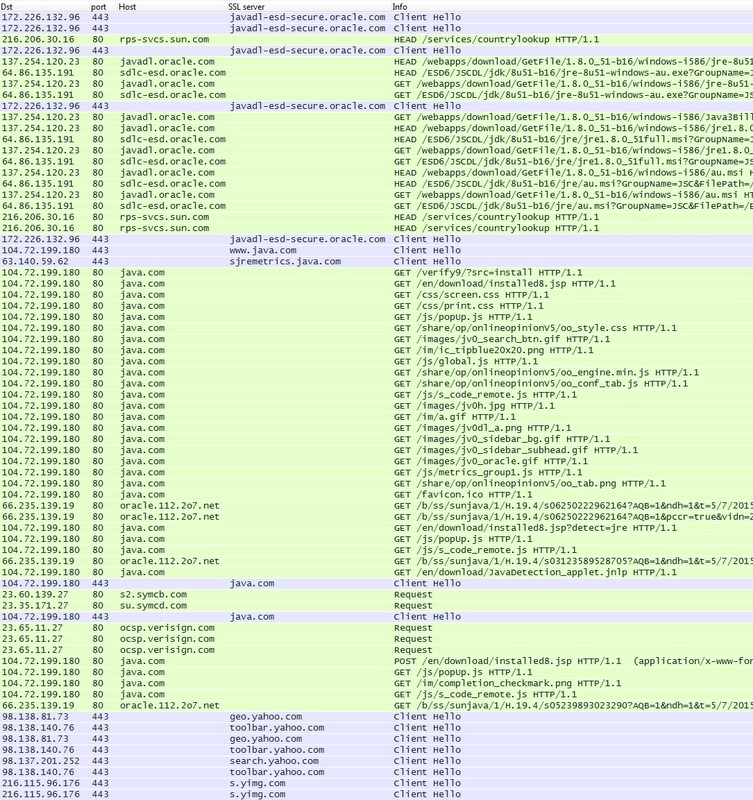 I'm posting some legitimate Java update traffic in response to a reader request to see what it looks like. I had a machine update from some out-of-date version of Java 7 to the most up-to-date version of Java 8 (currently update 51). I heavily edited the pcap, so it should only have the HTTP requests, responses, and SSL packets that contain the server names in the Client Hello packet. Thanks very much for your blog and trace files and explanations. I have still yet to have a good look through things, however I thought I'd ask if you have ever done an analysis of legitimate Java update traffic? I am curious to see what proper communications should look like, and what servers might be involved in the update process, as this might allow me to better catch traffic that attempts to hide itself under this process. Would you have anything I might use? Might make for an interesting post otherwise? I don't have anything off-hand, but I might be able to generate some legitimate update traffic as an example. Let me see what I can come up with in the next few days.